1. Açaí (ah-sah-ee)- whether you’re a fan of this purple Amazonian superfood or a newbie looking to try it out, you won’t be disappointed. Try an açaí bowl with fresh-cut fruit, granola, and honey either blended together or placed on top. The açaí in the states pales in comparison to the quality available here! 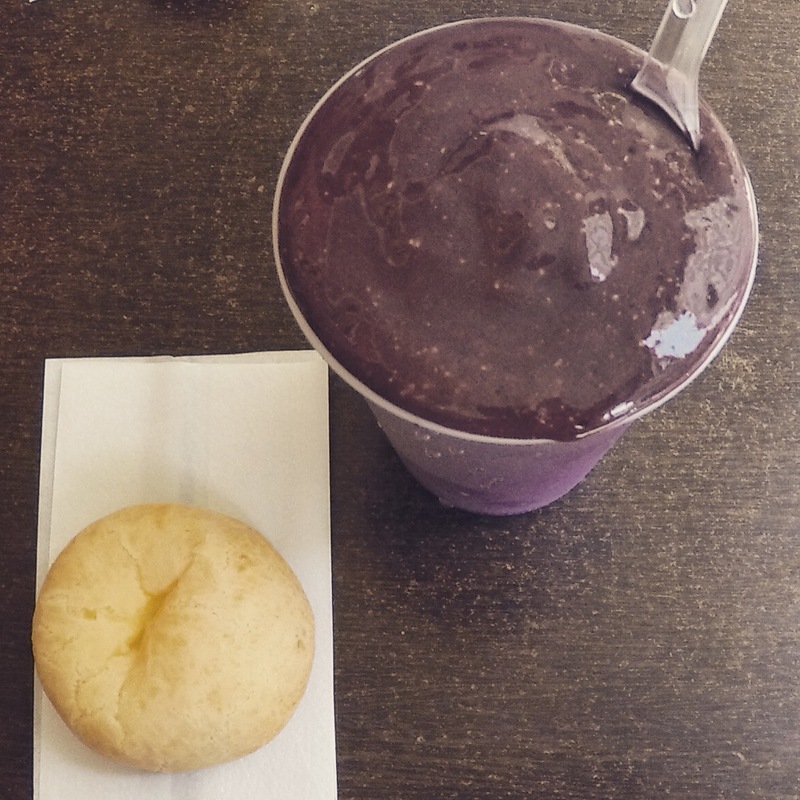 Açaí and pão de queijo. What else do you need? 2. Beautiful beaches– we’re staying in the Copacabana region of Rio (still haven’t seen Lola), and the beaches are absolutely tremendous. Both the Copacabana and Ipanema beaches are within walking distance of our Airbnb apartment and we highly recommend the area. The water feels especially refreshing in the hot sun and the waves are enormous, which makes for a fun time if you like the water! 3. Charades– looking to hone your acting skills? If you don’t speak Portuguese, this is the place for you! We’ve had several encounters where we had no choice but to resort to gestures and pointing in order to communicate. Karen had to simulate taking a shower to get Sofi a bath at the veterinarian, and two of our new friends from Ireland got to test their skills to purchase ear plugs at the pharmacy. Whatever it takes to get the job done! 4. Fitness– Like many “beach cities,” this one is fully equipped with people who are passionate about fitness. I always find it inspiring to go for a run and see hundreds of other people working out and running with me. There are even a few outdoor gyms (which are free to use!) for those of you looking to work on your pecs during your stay. 5. Pão de queijo (with catupiry cheese)- quite frankly, this is the most delicious food item we’ve eaten in all of South America. Big statement, but it’s true. I mean who doesn’t love soft, warm bread stuffed with oozing, warm cheese? The regular pão de queijo (baked cheese roll) is delicious on its own. But bake it together with a Brazilian cream cheese known as catupiry? Next level. 6. Stellar views– with famous sites like Christ the Redeemer and Sugarloaf Mountain, you can take in breathtaking views which overlook large areas of the city. If you enjoy a good sunset, head to the beach and grab a seat at “aproador,” a large rock formation jutting into the Atlantic which offers 180-degree views of the horizon. There are even vendors selling beverages to enhance the experience. Karen and I taking in the view atop Sugarloaf Mountain. 7. The “good stuff”– if you take a seat on the beach in Copacabana, within five minutes there will be a plethora of vendors coming through to sell you things. They offer drinks, food, umbrellas and other souvenirs. But trust us: nobody is ever actually selling umbrellas. If you decline them once, they will ask if you want the “good stuff.” Maybe my beard is attracting the wrong crowd? Check out some of our highlights from Rio in the video below! Tired of Stress-Free Travel? Cross an International Border with the Kimbles! Wow. Has it already been two more weeks since our last update? 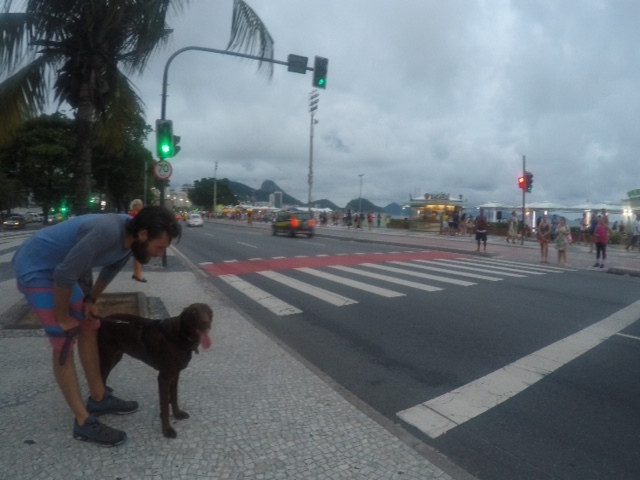 We’ve been in Rio de Janeiro (Copacabana area) for three days now and are staying at an AirBNB with great wifi, which means…more frequent blog posts! The first morning after we woke up in Rio, our hosts asked us if we would travel with Sofi throughout South America if we were given the chance to do things over again. We both looked at each other and answered the same way: yes! In spite of the interesting and often difficult challenges of traveling internationally with a large animal, we’ve successfully crossed three international borders and only ended up homeless on one occasion (more on that later). The most recent adventure started in southern Chile as we prepared to fly from Puerto Montt to Rio de Janeiro, with a layover in Santiago. Given that Puerto Montt is a fairly small airport, there were no direct flights to Rio. 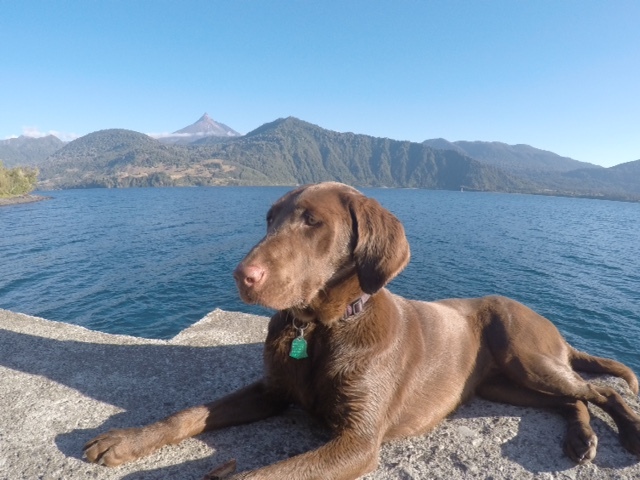 Knowing that we had some additional paperwork to handle for Sofi, we took her to the vet the evening we arrived back in Puerto Montt after working as farmhands for three weeks. It was a Friday and we were scheduled to fly out on Monday afternoon. The following morning we went to the airport to speak with some people in the cargo terminal to find out the additional details of what we would need to get Sofi to Brazil. Sofi noticed Rio is a bit more humid than most of South America. On the way to the airport we were waiting at a red light and wanted to ensure we were taking the correct route (since we’ve had to navigate during the trip without GPS or cell phones…anyone grow up when those things didn’t exist?! ), so Karen rolled down the window and spoke to the gentleman in the car next to us. He happened to be going to the airport, so he told us to follow him there! We were still a solid 20 minutes away, so it was definitely a Godincidence that we happened upon this man. We followed him all the way to the airport and proceeded to follow him to the cargo area, which is where we needed to go to talk with the airline company that would be handling Sofi’s transportation to Brazil. As luck would have it, this man happened to work for the very company (Lan cargo) we were looking for and after mentioning that we were there to ask questions about flying our dog across the border he responded by asking “are you Adam?” Amazingly, this guy was a world-renowned scientist of telepathy! …just kidding. I had sent several emails to them prior to our visit and he had been filled in on the situation. So, THIS was the man Karen randomly flagged down when we were still a long way from the airport? Incredible. At that point the fun really began. After speaking with our new buddy, we found out about additional paperwork we would need that was never mentioned before. There were two agricultural-type offices (Aduana and SAG) which needed us to complete forms, and neither of them were open on weekends. Given that we flew out on Monday, we decided to take our chances with filling out the paperwork once we arrived in Santiago. So, we booked Sofi on a flight to Santiago and then planned to locate these offices at the Santiago airport once we arrived on Monday afternoon. Fast forward to Monday. We arrived in Santiago with four hours until our connecting flight to Rio. For once I was really glad that I had a long layover! The rest of the day can be summed up like this: we pick up Sofi from the cargo area, walk all over every office outside of the airport, Karen speaks to the Aduana and SAG folks in Spanish to get all of the paperwork done, I sit with Sofi all day until we are told the SAG office only accepts cash, they’ll be closing in 15 minutes and the nearest ATM is located at the airport (luckily I don’t mind running every once in awhile), and finally, we arrive at the Lan cargo office to book Sofi on a flight and are told that there are no other flights going to Rio until the following day. We had gone into the day with the mindset that things would be crazy, unlike our initial experience in Lima, so surprisingly we were both feeling pretty good about the progress from the day. The only upsetting thing was missing our flight to Rio and having to pay to re-book it for the following day. As the sun set and things were winding down at the airport, we knew we had to be back in less than 12 hours to get Sofi on the same flight as us the next day. Rather than book a hotel and pay for such a short stay, we decided to go the cost-efficient route and rent a car instead. Little did the car rental company know, they were renting us a car and a place to sleep! We got some late night pizza and found a well-lit gas station close to the airport where the three of us slept all night. We’ve slept better, but we’ve also slept worse! The following day we headed to Lan cargo to finish Sofi’s flight booking and then we were off to Rio. You would think it would be simple enough to collect an animal on the same flight as you, but since Sofi is too large to be checked as baggage, we have to fly her cargo. That means they send her to a completely different part of the airport and we have to collect her there. After we made it through customs, we initially tried to rent a car big enough to hold her crate. Fortunately for us, there were no rentals available. We wouldn’t find out why that was fortunate until a few hours later. This meant our only option was to hire a taxi. Once again we became best friends with our cab driver, Edson, much like our friend Raul from Lima. He is a Portuguese man who spoke a little Spanish and was able to communicate enough with Karen to let her know what was happening. Ultimately, we spent about four hours at the cargo area trying to locate Sofi. There was some missing paperwork that Lan had taken to a different office and some miscommunication which delayed being reunited with her, but we were able to finally get her on Tuesday night just 24 hours after we were supposed to arrive! Edson even helped us avoid some “taxes” (also known as bribes) from the cargo warehouse. Having a Portuguese man on our side was exactly what we needed, and had we rented our own car, the events of Tuesday night likely would have been drastically different. Once again, it can’t be stressed enough: everything happens for a reason! Now we’re settling into Rio and enjoying the warm weather, nice beaches and beautiful scenery. 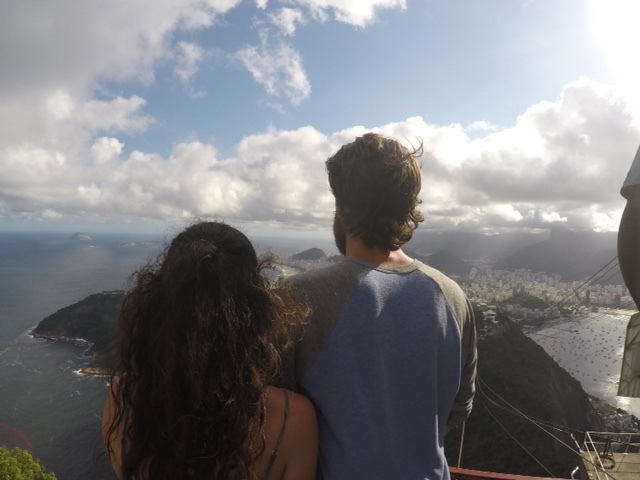 We’ve got some awesome hikes in our future, including one to the well-known “Christ the Redeemer” statue. More updates to come over the next week and a half! 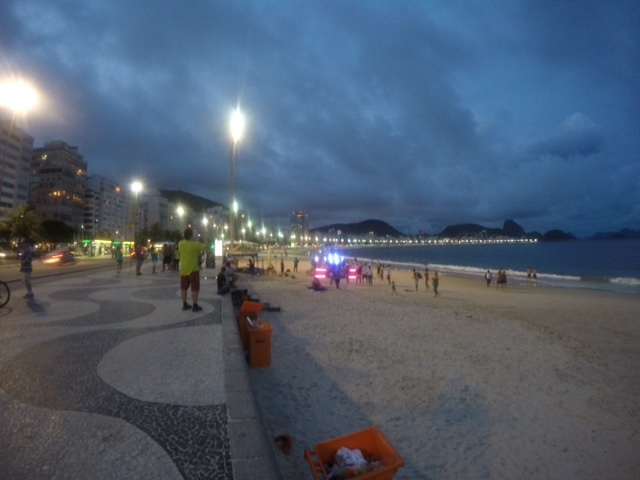 A nighttime view from the beach in Copacabana. 14 Tips For Having the Most Romantic Valentine’s Day Ever! Last Friday morning we officially said our “see ya laters” to Cusco and began the first portion of the journey that would lead us to Chile. It was bittersweet to leave the first stop on our RTW journey, but we were very excited for what awaited us! The itinerary went as follows: drive with friends of our host from Cusco to Puno (an estimated five hours), and then from Puno to Tacna (an estimated ten hours), the southernmost city in Peru. Everything was planned a little bit last-minute as we had a busy week prior with our friends Dan and Nichole visiting. We had nothing planned after that but knew we had to make our way from Tacna across the Chilean border to Arica. That gave us almost entire week to make it down the coast of Chile to the capital of Santiago, where we will fly even further south to Puerto Montt this upcoming Friday. Now, back to us leaving Cusco. We had absolutely no idea that one of the craziest days of our lives lay ahead of us on the only day we had actually planned out over the course of the week. As you also know, Saturday was Valentine’s Day. To help capture the essence of the events that followed our embarkation on Friday, Karen and I are happy to present to you the simple process for creating an unforgettably romantic date chock-full of cupid’s arrows. 1. Hire a private driver to take you from Cusco to Tacna. Make it to Puno (the first stop on the way) and hear your driver tell you that you are ahead of schedule and only have six more hours to go. 2. While in Puno, treat your lady friend to some ice cream and enjoy it on a sunny day in the central plaza. 3. Take the “shortcut” from Puno to Tacna, which will “save time” getting you to your destination. 4. Roll through an assortment of very small mountain towns, in which every person gives a completely different answer as to the length of time remaining on your journey. 5. Drive through “detours” on the route, which include fording streams (Oregon Trail style) that are deep enough to allow water into the car and begin soaking your feet. Watch as local llamas are wading through the waters with their legs completely covered. 7. Drive up to the top of a snow-covered mountain at 14,000 feet, drive your station wagon through the cake-like mud and putter out in a giant water-filled crater. 8. Try various strategies for over an hour to get the car removed, only to soak through every pair of dry socks that you have, lowering your body temperature enough to begin shaking. Teeth chattering yet? Perfect, you’re setting the mood nicely. 9. Run out of feasible options (with no cell phone service in the mountains) around 1:30am, and huddle together using your dog’s body as a temporary blanket. Turn off the car to go to sleep and wait for help to arrive in the morning. 11. Get towed out by the truck, only to begin silently weeping as your car battery stalls. Watch the battery turn over just in time to catch up to the truck. 12. Drive over a rock plateau and get stuck again after the truck has already left. Watch as your wife spends Valentine’s Day chiseling rock from underneath the car at 4am. 13. Take one more cat nap in the car before cruising into Tacna just 12 hours after your estimated arrival time. 14. Remember that you’re together, everyone is safe, and everything will be all right! In our minds, we had a timeline for how and when we would arrive in Chile. However, God’s timeline was much different than our own! But the most amazing part is what ensued after the madness. We arrived in Tacna fairly early on Saturday morning. From there, we met a driver (he also happened to be a police officer) who was not only able to get us across the border to Arica with Sofi’s crate, but he even made a call to a friend to find out every detail we needed to get Sofi into Chile. He drove us to a couple different offices to get the necessary paperwork to make the following day a breeze. On top of that, this man introduced us to another friend who ended up driving us from Arica to Iquique, our second stop in Chile. And, wouldn’t you know it, this gentleman was a bus driver who had permits for securing Sofi’s crate to the top of his car. God’s timeline was certainly different than our own, but it was perfect. Everything happens for a reason! The Sacred Valley, Quillabamba, Machu Picchu, Oh My! 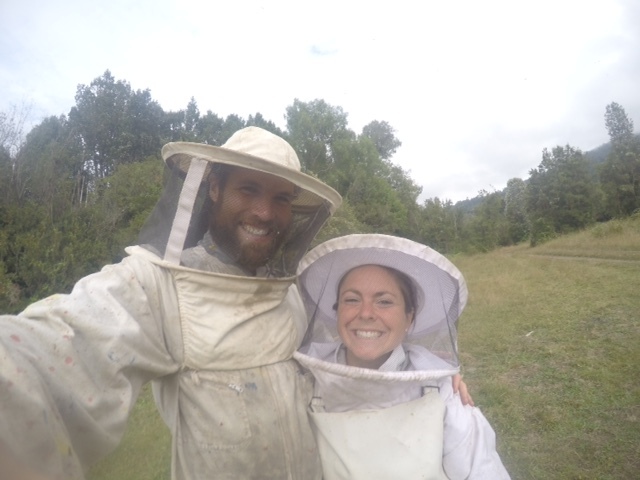 Two days after our travel companions Dan and Nichole arrived last weekend, we embarked on an epic four-day adventure culminating with Machu Picchu. Now, it’s important to know that there are a variety of options for visiting the sacred Inca site. You can do it simple and cheap via a one (albeit long) day trip on the train. You can schedule a much longer trip, oftentimes seven or eight days, in which you visit all of the Inca ruin sites from Cusco all the way to Aguas Calientes, the city nearest Machu Picchu. Or, you can do a private tour in which you determine the length of your journey, as well as the stops along the way. The best choice for you will depend on your agenda, the time you have available, and your preference for a more or less rigid schedule. For us, we determined that a four day trip made the most sense and we knew we wanted to visit Machu Picchu in a less conventional way. This meant that we were going to take the private car tour. Our host’s father, Daniel, has long been a tour guide in Cusco and he has a wealth of knowledge regarding the Inca (or more accurately, Quechua) people. 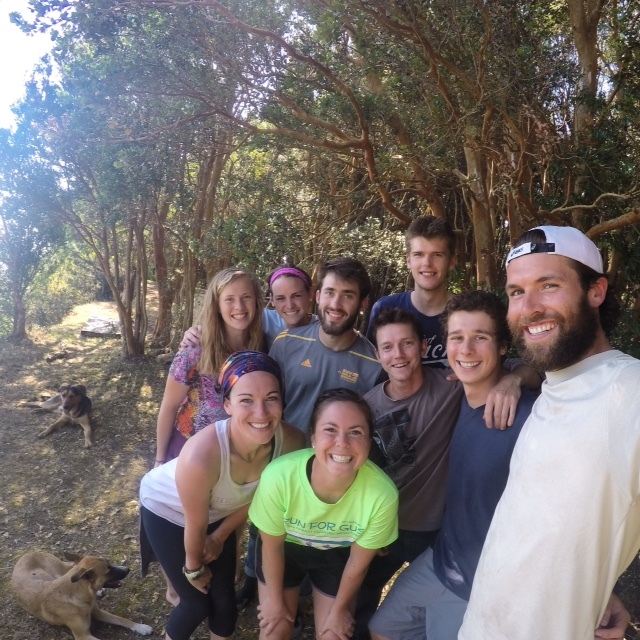 So, the five of us (and our driver, Carlos) left early on Monday morning to head to a few sites in the Sacred Valley. We visited Chinchero, Moray and Ollantaytambo during the day before heading to the jungle of Quillabamba on Monday night. We spent all of Tuesday in Quillabamba and stayed for one more night before heading to our next stop in Cocalmayo/Santa Teresa on Wednesday afternoon. At this point in the journey, we left our vehicle and hiked from Santa Teresa to Aguas Calientes on Wednesday evening. This set us up for a beautiful Thursday morning at Machu Picchu, followed by a long trek home that night. 1. Flexibility. You aren’t tied to a specific timeline through private car transport. There are options to stop off somewhere for lunch, spend extra time at certain sites and even pull off of the road if someone is getting carsick. A private tour puts you in control of your schedule. 2. The ability to travel off the beaten path. More than half of our four days was spent at sites that the train surpasses on the way to Machu Picchu. The jungle in Quillabamba and the natural hot springs at Cocalmayo are “must-sees,” and you wouldn’t get to see them taking a direct route! 3. Enhanced knowledge of the Inca sites. Daniel was constantly dropping knowledge during the car ride and at all of the archaeological sites. 4. A more personal experience. There’s definitely a different feeling when you have one tour guide for four people versus a large group. Everything was so interactive (like climbing trees to pick your own avocado!) and being in a smaller group allowed for us to ask questions and really understand the culture and history. 5. Better bang for your buck. The price of the train ticket alone (not including entrance to the sites) is about a third of the cost of what we paid for our four-day excursion. 6. Cultural experiences. We made various stops at fruit stands and markets along our route, giving us an opportunity to try so many new things (ever tasted a pacay?). Not to mention we were able to visit local farmers in Quillabamba and enjoy organic coffee, fruits, meats and vegetables! 7. You can bring your dog! Sofi experienced every bit of our four-day trip with the exception of Machu Picchu, so she definitely recommends a private car. 8. Insane scenery. Our route to Quillabamba allowed for a pass through the snow-capped mountains at over 14,000 feet! 9. Working off the “car” legs. The mountains don’t allow for cars to make it past Santa Teresa, so we enjoyed a 10-kilometer hike to Aguas Calientes. The path follows the train tracks and gives a little sneak peak of Machu Picchu near the end of the trail. 10. Memorable videos. Daniel encouraged us to take time for pictures and videos, so we never felt rushed. See below for a video of our journey from start to finish!